Within a day of losing one of its greatest inventors and proponents, Bob Moog, electronic music has now lost one of its greatest compositional voices. 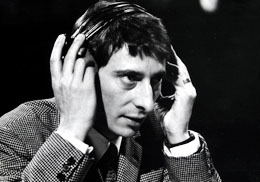 Paris-born composer Luc Ferrari was a pioneer both of electronic and instrumental avant-garde music. He was the founding director of the Groupe de Musique ConcrÃƒÂ¨te in 1958 and was, along with Pierre Schaeffer, one of its leading practitioners. As a documentary producer, he profiled composers from VarÃƒÂ¨se to Cecil Taylor. He continued as an active composer, teacher/lecturer, and “sound hunter” throughout his life. [On his Nagra-recorded tape pieces:] Musique concrÃƒÂ¨te was a kind of abstractisation [sic] of sound-we didn’t want to know its origin, its causality… Whereas here I wanted you to recognise causality-it was traffic noise it wasn’t just to make music with but to say: this is traffic noise! As with Bob Moog, if anyone has memories or reflections they’d like to share, please drop me a line.